WASHINGTON -- Researchers have confirmed something that might have been obvious to unemployed people for a while: The longer a person is out of work, the less likely it is he or she will find a job. The authors of a new National Bureau of Economic Research study sent 12,000 fake resumes to real online postings for jobs in 100 U.S. cities in 2009. In each resume, the fake job candidate had been out of work anywhere from one month to three years. It turned out that the longer the jobless spell, the fewer the callbacks. 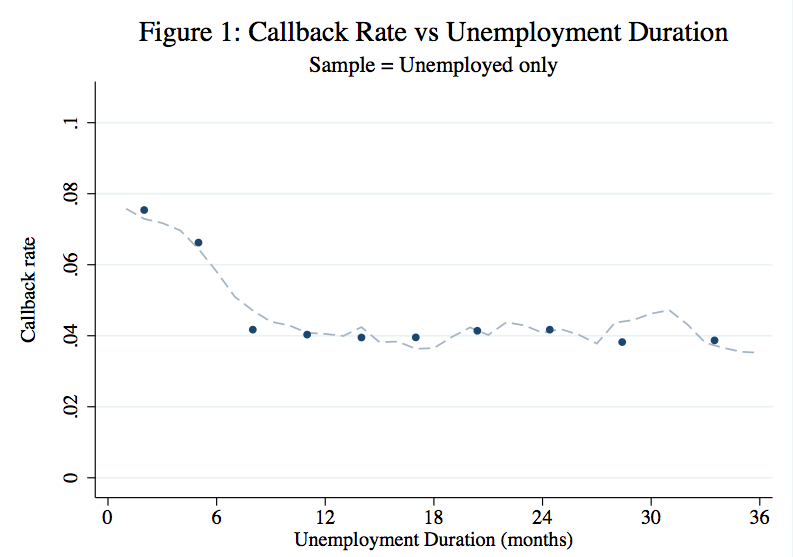 "Our results indicate that the likelihood of receiving a callback for an interview significantly decreases with the length of a worker's unemployment spell, with the majority of this decline occurring during the first eight months," write Kory Kroft, Matthew J. Notowidigdo and Fabian Lange in their working paper. The authors noted that despite widespread interest in the notion that longer unemployment spells diminish workers' job-finding prospects, it's been difficult to prove because two job candidates who look similar to researchers might look different to employers. That's how they came up with their fake resume idea. "At eight months of unemployment, callbacks are about 45 percent lower than at one month of unemployment," according to the study. The callback rate falls from 7 percent to 4 percent in that time. Pamala Plastock of Highland Park, N.J. had a clue something like this might be happening. A clinical psychologist, Plastock lost her job when the New Jersey government under Republican Gov. Chris Christie closed several residential treatment centers for delinquent youth last year. "When I was first unemployed I had a number of interviews, and I went to them, and for some reason or another it wasn't the right position," Plastock, 57, told HuffPost in an interview. "After around six months, suddenly I wasn't getting calls for interviews at all, even though I was still sending out my resume. They just dried up. I was sending them out and sending them out and nothing and nothing and nothing." Another recent study asked hiring managers to look over resumes that were identical except in one respect: Half said the job candidate had been unemployed one month, and half said the candidate already had a job. The "currently employed" candidates received more positive evaluations from the hiring managers even though they had the same specs as unemployed ones. Plastock said it's "validating" to see research confirming her personal experience. After 15 months of unemployment, she said she finally found a new job as a psychologist with a state agency, though she has not yet received a start date. She's grateful to have work, but her long jobless spell still burns. She used three words to describe how she felt as her callbacks dwindled. HuffPost readers: Unemployed? Tell us about it -- email arthur@huffingtonpost.com. Please include your phone number if you're willing to do an interview.